It's November, and I've got Thanksgiving on my mind. 'Tis the season to be thankful, and also to think about big smorgasbords. Pacific Northwest Ballet's November 2014 "Director's Choice" program is a lot like one of those Thanksgiving feasts. It offers an array of entrees, some tastier than others. The evening is book-ended by two big works: David Dawson's "A Million Kisses to My Skin" (more about that later), and the new PNB commission "Debonair," by New York City Ballet choreographer-in-residence (and dancer) Justin Peck. PNB billed "Debonair" as a world premiere, although New York audiences got a sneak peek in October at the Joyce Theater. It's a dance for 12 performers, set to American composer George Antheil's "Serenade for String Orchestra No. 1." As the evening's closing dance, it was meant as the program's capstone. It would have been better as an aperitif. Peck constructed a ballet in three sections; two lively pieces sandwich the dance's strong center, a tender pas de deux performed on opening night by the beautiful Carla Korbes and Jerome Tisserand. The main problem with "Debonair" (aside from the men's costumes) was its placement on the "Director's Choice" bill. The dance is an amuse-bouche, not an elegant dessert. Despite the very lovely pas de deux, the work as a whole is light and fizzy; charming, but ultimately forgettable. The meat and potatoes of this program are Annabelle Lopez Ochoa's "Before After" and Nacho Duato's "Rassemblement." 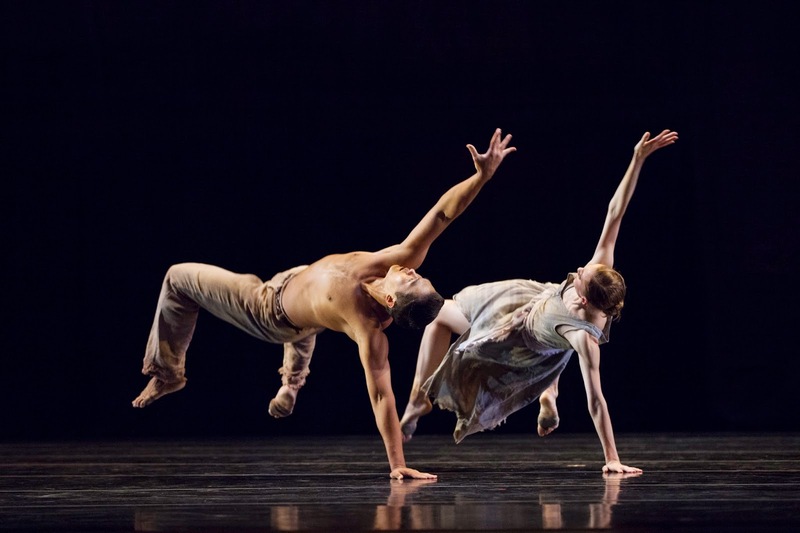 in Annabelle Lopez Ochoa's "Before After"
I first saw "Before After" several years ago, presented by former PNB dancer Olivier Wevers' company "Whim W'him." Lopez Ochoa performed with former PNB principal Lucien Postelwaite. Their emotional connection was riveting. PNB corps de ballet members Raphael Bouchard and Angelica Generosa give an electrifying and technically dazzling performance, but it lacks some of the oomph that would have lent this athletic duet psychological depth. Soloist Elizabeth Murphy had been scheduled to perform opening weekend, but pulled out due to an injury. Generosa and Bouchard had one day to rehearse together before opening night. I'll chalk up the lack of rapport to that. PNB's Angelica Generosa and Raphael Bouchard in Annabelle Lopez Ochoa's "Before After"
Nacho Duato's "Rassemblement," set to traditional Haitian songs, is a plaintive and powerful rumination on power, powerlessness and subjugation. And it was a showpiece for Batkhurel Bold on opening night. Bold is one of those solid, and stolid, dancers. He is so strong and handsome, but he doesn't always emote. In this dance he positively mesmerized with feral energy. Lunging sideways across the stage, he's like a wild cat trying to evade his stalkers. When they finally capture him, he dangles upside down from their shoulders, abject and wretched. I had to shiver from the sense that his blood was actually dripping down. On opening night, Lindsi Dec danced the principal female role, the narrator of this sad story. Saturday evening Carrie Imler stood out as the storyteller. Dec conveyed a wounded nobility, but Imler's agony oozed out through her rippling fingers, her splayed knees. "Rassemblement" is another Duato knockout of a dance; All the cast members were good, but ultimately, it's the image of Bathkhurel Bold that lingers in my mind. "Director's Choice" opened, but should have closed, with David Dawson's wonderful "A Million Kisses to My Skin." Dawson created it as a love letter to both his fellow dancers and to the art form of ballet, and it never fails to captivate me. The dance is set to J.S. Bach's "Concerto No. 1 in D Minor," performed superbly by the PNB orchestra and pianist/conductor Allan Dameron. It begins as an insouciant Sarah Ricard Orza strides downstage toward the audience then, bam, the music starts and she propels herself into a wickedly difficult solo. in David Dawson's " A Million Kisses to My Skin"
"Million Kisses" is full of sly, complex surprises. If you look away for a second, you might miss the way Orza drags one pointed toe across the floor, or Margaret Mullin's sideways stag leaps. Or the way Carrie Imler and Jonathan Porretta throw us cascades of pirouettes, their arms arched gracefully overhead. From Porretta and Imler, to the elegant Lesley Rausch, every dancer in this ballet delivered. Rausch has such wonderful control over every muscle. The descent of her knee, then beautifully extended foot, then toe to the floor is as thrilling as Imler's jetes across the stage. 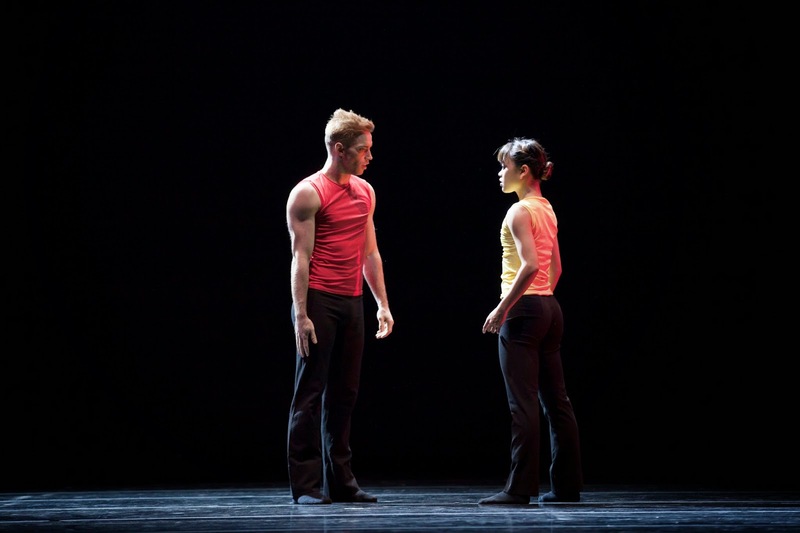 in David Dawson's "A Million Kisses to My Skin"
I first saw "Million Kisses" in 2012, when PNB debuted it here. I loved it then, but this time around I was even more taken with the way Dawson deploys his cast, the patterns he creates with their bodies, and the ways he skillfully, and subtly, subverts the classical ballet vocabulary. This dance wowed the crowd as the opening number, but it would have been so much more powerful as the show closer. As much as I loved the variety of the 2014 "Director's Choice" bill, "Million Kisses" is the dance I keep thinking about. One last note: three dancers are out on maternity leave and two principal men are injured. While I miss seeing them onstage, it's great to watch the younger dancers get a chance to perform in featured roles. Angelica Generosa is a tiny dynamo who seems to handle whatever choreography she's given; Raphael Bouchard, Price Suddarth, Kyle Davis and Chelsea Adomaitis all gave notable performances and make me excited for what lies ahead at Pacific Northwest Ballet.